5.2 We do not store credit card details nor do we share customer details with any 3rd parties. 8.3 All electronic financial transactions entered are done so via PayPal. 13.1 This website is owned and operated by Jeremy Waller. 13.2 We are registered in England and Wales under registration number 05130575, and our registered office is at Hearts Of Oak House, 4 Pembroke Road, Sevenoaks, Kent, TN13 1XR. 13.3 Our principal place of business is at 26 Monson Road, Tunbridge Wells TN1 1ND. 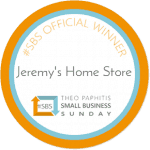 13.4 You can contact us by writing to the business address given above, by using our website contact form, by email to shop@jeremyshomestore.co.uk or by telephone on 01892 525976.